I think that all sourcers and recruiters can agree that networking is essential. It helps to provide deeper connections with colleagues and community members. But what about the network you work with day in and out? Are you and your company fully utilizing your employees’ and coworkers’ networks? Your coworkers are great resources for candidates. After all, they already work for the company so they can speak firsthand regarding all the great things you sell to candidates, such as the culture, perks, and benefits. Employees can give insight and perspective to a personal candidate that a sourcer or recruiter never could about the position and the company. Your company probably has an employee referral program in place and implemented. The referral program probably offers your coworkers wonderful things like money, computers, gift cards, or swag. You find that employee referrals are few and far between. Why is that? I’ve tried to get to the bottom of why coworkers wouldn’t want to share their network with sourcers and recruiters. For some reason, there seems to be a barrier. So one day, I just started asking coworkers. It came down to them feeling judged. If their network (mainly their friends or family members) didn’t get hired into the company, they felt as if it was a reflection on them. At this point, I realized money, computer, gift cards or swag would not be motivating factors to get them to open up their network. So I added my own twist into our company referral program. My personal employee referral program is making sure that at the end of the month I write a handwritten thank you note to each coworker who referred a candidate. It doesn’t matter to me how far along the candidate made it through the interview process. My coworker took the time to send me an email, stop by my office, or tell me in person about this candidate. The least I can do is say thank you for helping me with my job. This is especially important to me since I know they are already feeling like they are on the line for referring. A handwritten thank you note is a way for me to acknowledge that I appreciate them for taking the time to share their network with me. Not every employee referral lead is going to work out and become a hire, and that’s ok. Just letting my coworker know this breaks some of the tension they were feeling. Included in the handwritten note, I add a little something extra into the card. The extras are funded by the employer—THANK YOU KSS Enterprises! Since I’ve been writing handwritten thank you notes, I’ve had repeat coworkers send me candidates. On top of that, coworkers who had commonly been nonresponsive to sharing their network started to open up their network to me. 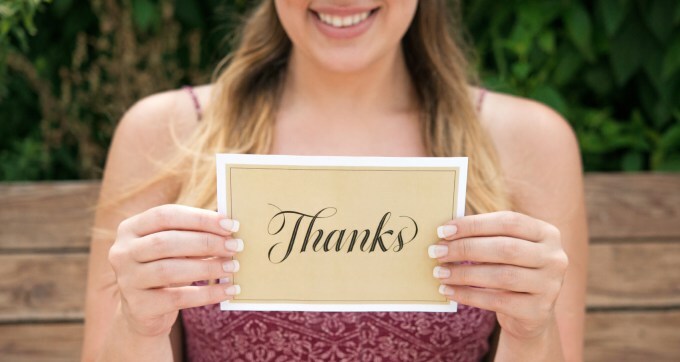 The main point is, even if your company doesn’t have an extravagant referral incentive program, like a new car, anyone can write a thank you note. Kayleen Shafer is a Recruiter at KSS Enterprises along with 5 sister companies. She covers any requisition such as Custodian to Director in the full cycle recruiting process. KSS just won the 2018 Employer of the Year Award from Western Michigan University for the recruiting partnership built with the Business College. As a young professional, Kayleen is a newcomer to the sourcing & recruiting trade. She spent 5 years in the banking industry before finding her true passion for H.R. & sourcing. She has a Bachelor of Business Administration from Grand Valley State University. Kayleen believes in 100% transparency and building relationship within all facets of recruiting. She is a member of ATAP, KHRMA, a local Recruiter Round Table group, & a board member of Kalamazoo Parks & Recreation. In her free time, Kayleen loves to go kayaking with her husband Karl and aquatic Goldendoodle, Luna. Please email kshafer@kssenterprises.com or connect with her on LinkedIn, linkedin.com/in/Kayleen-shafer-b97728112.